Cedarville’s Colby Cross and Southeastern’s Charlie Bertemes battled throughout Friday’s Ohio Heritage Conference boys high school basketball game at Cedarville High. Cross led the Indians with 14 points, while Bertemes led all scorers with 20. Cedarville sophomore Caleb McKinion braces for a foul by Southeastern’s Bryce Grim, in the first half of Friday’s Feb. 8 basketball game. 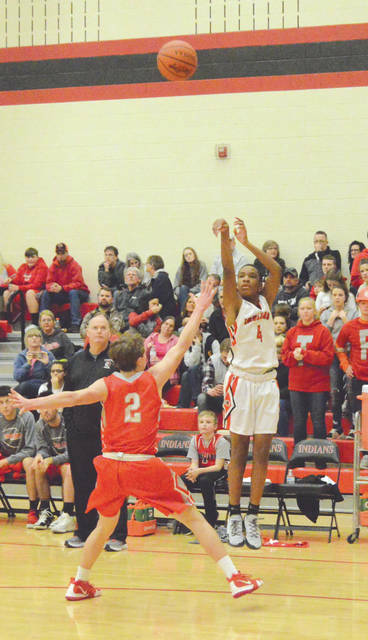 Isaiah Ramey (4), shown here firing up a three-point try in the first half Feb. 8 in Cedarville, connected on four of six free throw tries in the closing minutes of the Indians’ 45-41 home win. CEDARVILLE — It’s true in any sport. Good teams face adversity and figure out a way to overcome it. Cedarville was a good team on Friday, as they rallied to a 45-41 win over Southeastern, Feb. 8 in the Cedarville High School gymnasium. Down 36-32 with one quarter yet to play, with their leading scorer (Colby Cross) in and out of the lineup with foul trouble and their second-leading scorer (Trent Koning) out with an apparent ankle injury, Cedarville persevered. Cross was in long enough to drain a 3-pointer from the top of the arc to pull the Indians to within two points. C.J. Pahl then drew a charging foul to fire up Cedarville for its next possession, then Cross scored from the right baseline to tie the game at 37-all with 5:24 left in the contest. 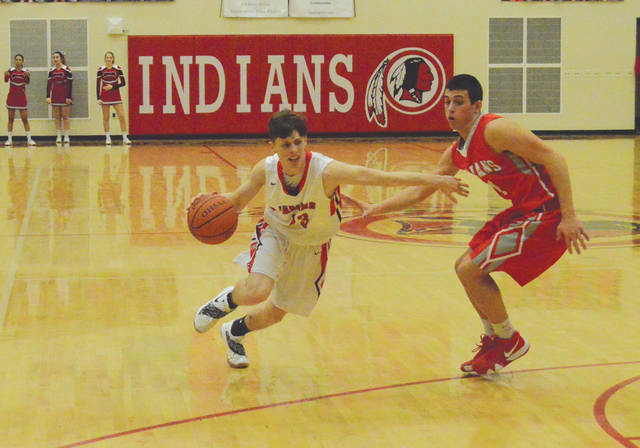 Cross drew his fourth foul just 10 seconds later, and so Indians coach Ryan Godlove went with a rare lineup without his two leading scorers for three Trojan possessions. “With Colby and Trent out like that, I thought the guys did a nice job of not turning over the basketball. We’re not used to playing without either one of those guys out on the court. So to be able to remain in control, for us to take care of the basketball with both of them out, that was big,” Godlove said. Cedarville got its first lead with 2:44 to go, and never trailed again. Cross never got that fifth foul, but did finish with a team-high 14 points. Koning missed the final two minutes of the third quarter and all of the fourth, but still managed to score 11 points. Ramey hit a bucket, plus 5-of-7 free throw tries in the game’s closing minutes, to finish with seven points, Pahl added six points, Brandon Pollock scored five and Caleb McKinion scored two points as well in the win. Cross also had the unenviable task of defending against Trojans senior Charlie Bertemes for most of the game, and that likely led to his foul troubles. Bertemes was a strong inside presence early on, and the Southeastern senior finished with a game-high 20 points, but he was limited to two points in the fourth quarter. Bryce Grim and Owen Flannery both finished with eight points in the loss. The Trojans had defeated Cedarville in South Charleston back on Dec. 18, 2018 in their first meeting of the season. 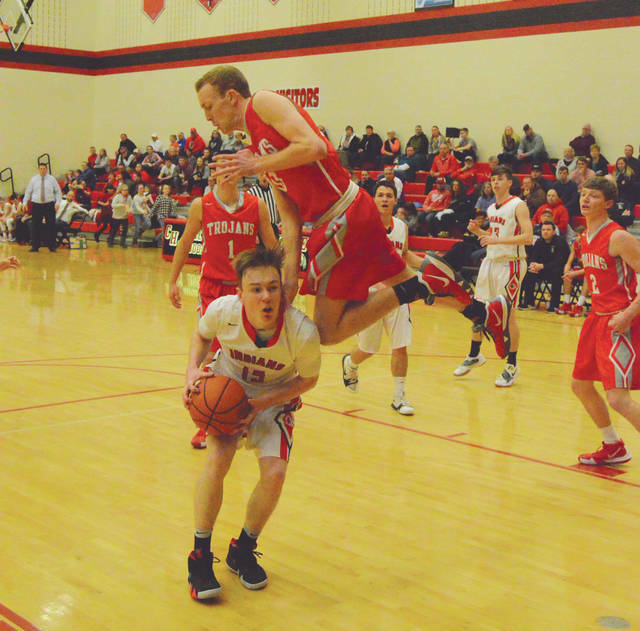 A win Friday would’ve enabled the Trojans to leapfrog past Cedarville into second place in the Ohio Heritage Conference’s South division. Instead, Southeastern is now 8-10 overall, 7-7 in the OHC South, while Cedarville holds second at 11-9 overall, 9-6 in the division. Having played three games in the past four days, Godlove remained grateful for his team’s ability to battle through injury and foul trouble on Friday. The Indians don’t play again until Tuesday, Feb. 12, a nonleague road game at Middletown Christian. “Isaiah’s free throws were huge for us down the stretch. He’s a kid who’s been playing really great for us lately. Our whole bench has really grown from game 1 to Game 20. That’s huge for us. We needed a deep bench. We needed everyone tonight,” he said.